Hankering for something sweet? These adorable, non-traditional carrot cake push ups are a perfect way to satisfy your sweet tooth and please both tiny and grown humans alike! And an added bonus? They're super easy to make. Pre-heat oven to 350 degrees. Spray 48 mini muffin tins with non-stick cooking spray, set aside. Follow directions on the back of cake mix box for mixing. Scoop cake batter into greased mini muffin tins, fill about 2/3 of the way full. Bake in 350 degree oven for 10-15 minutes or until a toothpick inserted in the center comes out clean. Let cool on cooling rack. Remove the top of the cupcakes with a serrated knife. Fill a small ziplock bag with frosting and cut tip off of the bag to pipe frosting into push up containers. Stack cupcake bottoms into push up containers alternating cupcakes and frosting. 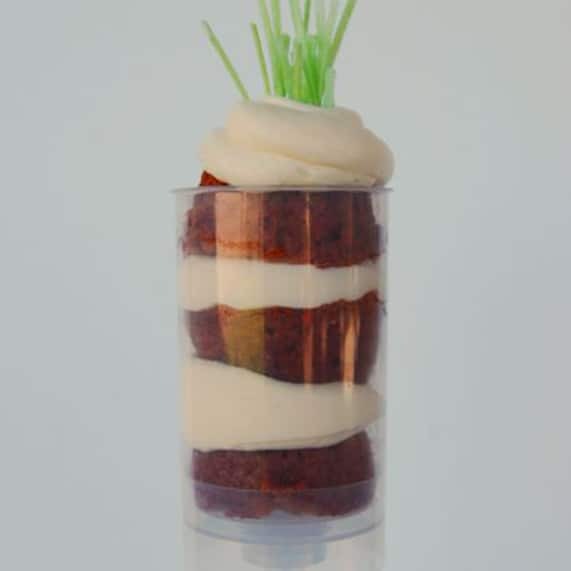 Top the push up with frosting and a small bunch of edible Easter grass to give the look of a carrot top. Recipe courtesy of our friends at Spoonful.